I popped home (i.e. to Worcestershire) at the weekend and realised, once again, what an amateur I am in the growing stakes. Apparently I should have sowed my sweet peas a few months ago and yes, come to think of it, I do remember Monty Don in that fabulous out-house of his, on Gardener’s World, doing just that. Couldn’t tell you when it was though. So as my mother and Cousin Sue discussed the dark sweet pea varietals that Sue is growing for a wedding (a wedding! Last year my flowers filled one jam jar, full stop) I thought I’d better get on with it. I’m not that fussy what kind of blooms I end up with, I just want a few flowers that smell nice to put in my Queen Elizabeth 1952 coronation mug. So yesterday we went to the garden centre at Bournville and came back with three packs of seed, root trainers, seed compost…plus other sweet pea essentials such as packs of onions and lilies and new gloves. Hmmm. 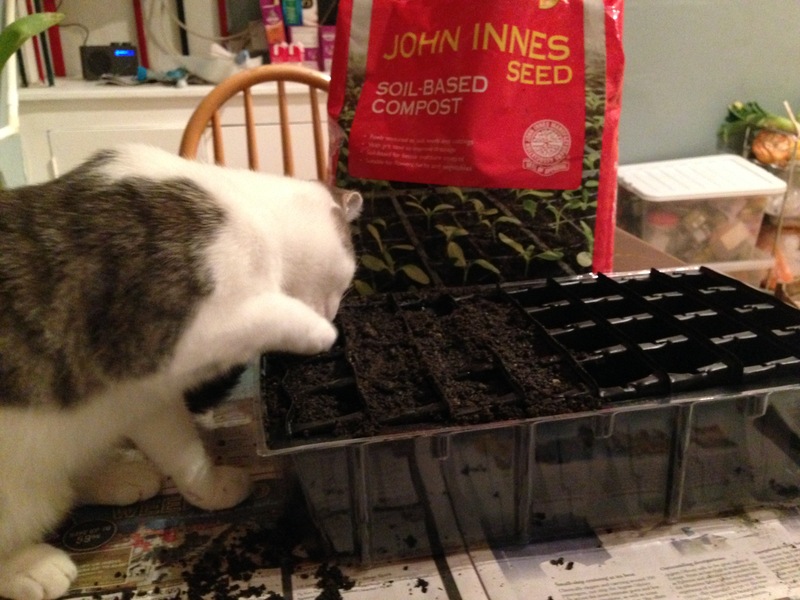 And today I occupied myself for half an hour with some kitchen table seed sowing, the first of 2015. I’ve put in three varietals; a pretty white climber, a fat deep blue monster, and a highly-scented mix to bulk it all out. There are occupational hazards of allotment gardening when one lives in a flat, the first being that the seed sowing tends to happen indoors, in the kitchen, rather than out in the snow and gales. I only slightly exaggerate; it gets cold in this city. Being flat-bound means that I don’t have the right kit. All the books say to water the compost with a watering-can fitted with a fine rose. Who has one of those in a flat? 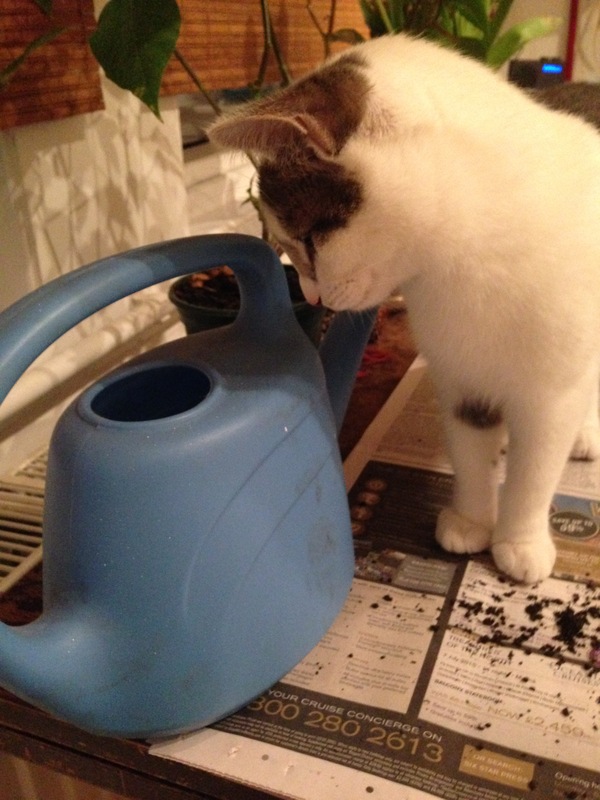 I used the shabby old watering can that we inherited when we moved in, and will hope for the best. The second hazard is that there is always a helper wanting to know what is going on. Once the seeds went into the root trainers, Gertie was in there like a flash hoping for a new taste experience. Once sown and watered, they get covered in cling film and placed somewhere dark. I think Monty Don has an especially-commissioned propagator for this purpose. 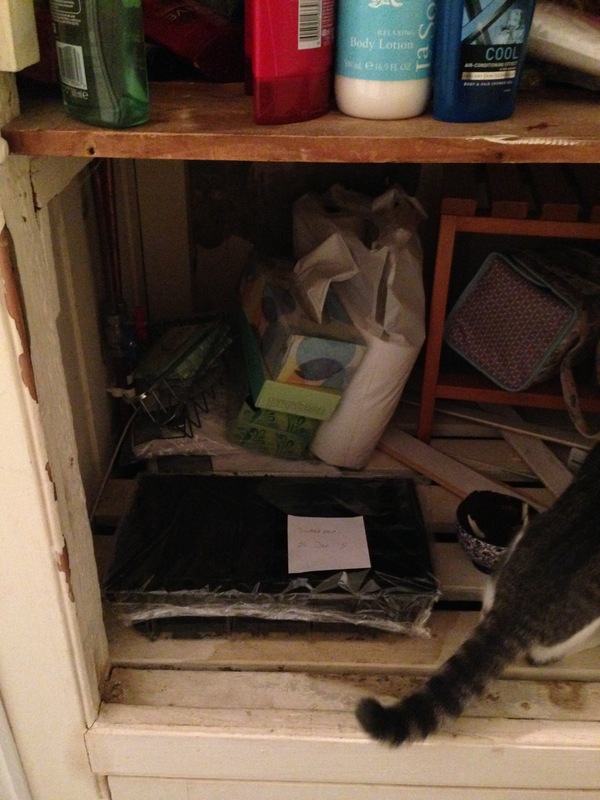 I have the bathroom cupboard. So in they go, next to the loo roll and spare shampoo. …and leave to germinate in a dark place. Fingers crossed for a bounteous harvest sometime in the summer.